Episode 6 - Political TV Ads Hit Record Numbers. But Do They Work? 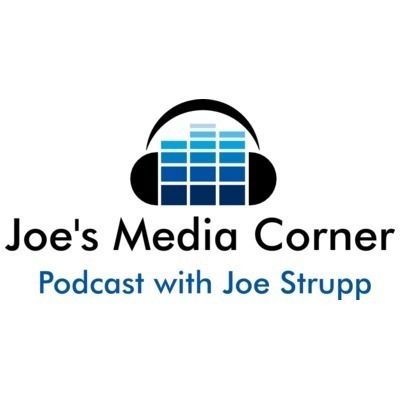 Joe's Media Corner is the podcast of Joe Strupp, a 30-year journalist who has spent the past 18 years reporting on news and media issues. He discusses a wide range of topics, from news media rights and critiques to the latest broadcast, cable and print trends. Movie critic and reporter Bruce Fretts of The New York Times and other publications joins me to chat about his best and worst movies list of the past year. Fresh off of the Golden Globes and gearing up for the Oscars, Bruce lays out why his favorites might not be yours, and his duds may surprise you. Check it out below. Episode 14 - What's the State of TV in The New Year? I spoke with TV analyst and ratings expert Marc Berman of The Programming Insider on where things stand with television as the new year opens up. We discussed which shows are up, and down, and where drama, comedy, reality series and sports fit in as the options for TV watching keep growing. But does the quality? Listen here. Voice Of America, the U.S. government-funded independent news source for hundreds of millions of overseas listeners seeking accurate information about the United States, is facing a major power change that could severely impact its credibility. New York Times reporter Elizabeth Williamson, who penned a recent front page article on this frightening prospect, offered great insight into the situation during a lengthy interview with me. Check it out. I spoke with National Public Radio media reporter David Folkenflik about the growing sexual harassment and abuse scandal at CBS News, which has forced out chairman Les Moonves and 60 Minutes executive produce Jeff Fager, as well as blemishing the legacy of the late Don Hewitt. We also discussed comedian Kevin Hart's forced departure from being host of the Oscars, and how raunchy performers face the prospect of headlining more conservative events. The new movie The Front Runner looks at the rise and fall of Gary Hart, whose affair was uncovered by investigative reporters and sparked his quick exit from a presidential race many thought he had sewn up. But was the press right or wrong? Should Hart have stayed in? And would it matter today? I spoke to author Matt Bai, whose book, All The Truth Is Out, is the basis for the movie that he co-wrote and helped produce. The great humor newspaper The Onion launched 30 years ago and former editor Scott Dikkers just penned a great book all about it. He spoke with me this week and offered great stories and background on the best humor publication since Mad magazine. Mike Ward was a veteran reporter at the Houston Chronicle. But when editors got a tip that some of the sources quoted in his stories could not be verified, they launched several internal investigations that led to his resignation this month and a very open review. I spoke to Chronicle interim editor Stephen Riley about how it was done. I also chatted with Lynn Walsh from the Society of Professional Journalists about the issue and how she is involved in helping newsrooms provide such open connections to readers through a great new program. New non-fiction political books are selling at a 50% increase over last year, according to data and analysts. We spoke with two experts about why this is happening and what it means for the industry. First, Karen McLean of the NPD Group, which tracks sales, and book editor Stephen S. Power of Thomas Dunn Books, a 25-year veteran of the industry. A new report from GLAAD (Gay and Lesbian Alliance Against Defamation) finds a record-high number of LGBTQ characters on TV this year. We spoke to GLAAD's Rich Ferraro about how this came about, what it means and why more is needed. We spoke with two political advertising experts, Steven Passwaiter of Kantar Media and Political Science Professor Jacob Neiheisel of the University of Buffalo, about the record-breaking money being spent this mid-term season, and why it may or may not matter. With the recent abduction and assumed murder of Washington Post columnist Jamal Khashoggi, we look at why he was targeted and the state of anti-journalism forces in Saudi Arabia and worldwide with two experts: Committee to Protect Journalists deputy executive director Robert Mahoney and Saudi Arabia expert and former Post Middle East reporter Thomas Lippman. Great insight into this tragic issue. We talk about the state of news jobs and their future with News Guild President Bernie Lunzer, who offered great insight into improved job protections at major newsrooms as well as the union's expansion into non-traditional platforms. But also updates on how the Guild is seeking new legislation to protect reporter safety and offer incentives to employers to hire more journalists. Talk radio is the focus of this episode as I interview Michael Harrison, the longtime editor and publisher of TALKERS magazine and Talkers.com. We discuss the state of talk radio on all platforms, as well as why it draws more conservative listeners than liberals. He also offers some insight into the early days of music radio, where he got his start. Our second episode is an in-depth look at coverage of sexual assault in light of the Brett Kavanagh hearings and the recent #MeToo movement. I speak with three experts on trauma and journalism on what is being done by today's reporters both right and wrong. My first episode includes an in-depth discussion with White House Correspondents Association President Olivier Knox, who reveals that several members of the White House press corps have obtained personal security details due to "credible" anti-press threats. He also offers insight into how the daily press briefings have been reduced and what the WHCA does beyond its annual dinner.